What brought you here today? 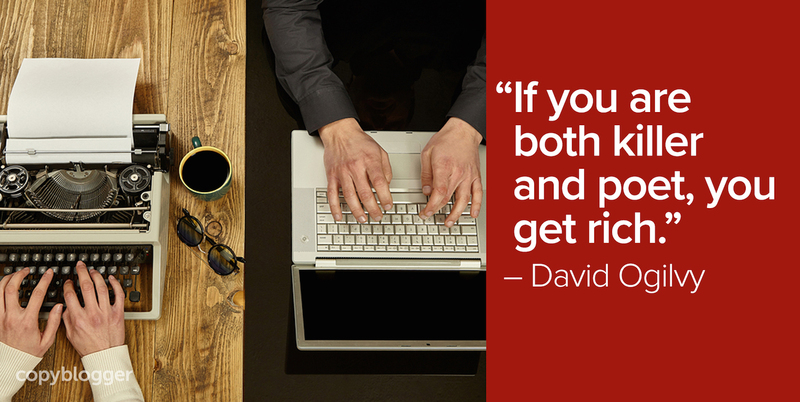 What are you hoping to learn, be, become, do, or change by reading Copyblogger? We’ll be asking that question a lot in the coming year, but while we wait (feel free to answer in the comments below — we’d love to hear it), allow us to talk about why we write this blog. We love writers. I mean, we really, really love writers. Both Brian and Sonia are lifelong scribblers. We write to explain ourselves to ourselves. We write to understand the complexities of the world around us … and our own heads. We write to teach, to engage, to encourage, to provoke, and — if we’re lucky — to persuade and yes, to sell. That’s because we also write to make a living. Which has been pretty good to us so far. Too much content produced in the name of digital marketing is viewed as simply a means to an end, and that’s why it fails. And yet, no one is interested in paying you to express yourself unless it also meets business objectives. “Poets” love language. We marvel at that perfect turn of phrase when we read, and strive to display that artistry in our own writing. Let’s face it — we’re word nerds. And that’s the foundational psychological quirk that sets us up for greatness. Most importantly, we write. Whether you love the process or merely love “having written,” once the toil is over and the words are out there, poets become great writers by putting in the work. Brian likes to say that he can’t teach a killer to be a poet, but you can always enhance a poetic type with other sophisticated skills. And that’s another reason why we love speaking directly to writers, because we’ve seen first-hand the amazing results that come when creativity is combined with a little killer instinct. In 2018 and moving forward, with the overwhelming volume of crappy content and mediocre filler, you want to cultivate that poetic nature. You want to put as much art into your marketing as you can. But we all know that there’s more to making an excellent living as a writer than just writing well. You also need some of that killer in you. The best copywriters and content marketing professionals understand how to combine poetry with purpose. When creative writing is employed strategically, with the aid of illuminating data and powerful technology, your capacity for meaningful impact and personal success skyrocket. Let’s take a quick look at these three “killer” skills as an overview of what we’ll focus on this year at Copyblogger. These are the three arrows you’ll need to add to your quiver in order to survive and thrive in the digital marketing space. Content marketing and copywriting, no matter how artfully executed, are not ends unto themselves. It’s ultimately about selling something, after all. Beyond business objectives, what constitutes the right words at the right time is completely determined by who you’re trying to reach. Guiding real people through the buying journey and prompting desired actions is an artful exercise, but it’s strategic purpose that leads your words to create exactly the right experience that leads to the sale. Modern marketing is all about the data, right? We’re drowning in information about our prospects, and yet we’re suffering from a lack of meaning. While the A-word tends to send poetic types scurrying away in fright, analytics is all about the discovery, interpretation, and communication of meaningful patterns in data. And while developments in machine learning can help us recognize the patterns, it’s going to take the soul of a poet to translate those patterns back to human emotional response. Pure killers love marketing technology. But as we’ve seen in the last few years, technology without emotional connection can actually hurt more than it helps. Marketing automation and conversion tools need to enhance the experience, not lead it. And the move toward personalized website experiences is a huge opportunity for writers to use smart technology to create content and copy that speaks directly to individuals, as if you’re having a personal conversation. It’s tough to succeed as a pure poet these days. You’re generally answering to a pure killer who sees you as a low-cost means to an end, and doesn’t value the blood, sweat, and tears you’ve invested in honing the craft of writing. Instead, the people thriving online these days are known as hybrid marketers. Yes, they can write — and they can do a whole lot more than that. Not only is that what clients are looking for, it’s what they’re willing to pay dearly for. The killer and the poet, all in one package. This year we’re committed to getting you richer, both financially and professionally. Sonia Simone is co-founder and Chief Content Officer of Copyblogger. Get more from Sonia on the Copyblogger FM podcast. I’ve been reading Copyblogger off and on since 2007, and still get a lot from it. I’m usually looking for content and headline inspiration, but I always end up studying the writing style itself. This blog is very easy to read because of the conversational tone, and I hope to integrate this style in my own work. Every time I start sounding like a textbook, I like to get taken back down to earth with a quick Copyblogger read. Thanks for the note, Carson! Nice one! I agree that strategy and analytics are core components going into 2018. I’ve just finished a certification in content strategy and now, I cannot stop talking results wherever I go. However, you had me at ‘Yes, they can write — and they can do a whole lot more than that. Not only is that what clients are looking for, it’s what they’re willing to pay dearly for.’ I’m yet to find these folks in the Indian market. They do realize that there is a great value-add in hiring me, but they just do not have the resources to pay. That makes me feel really stuck because as a freelancer, there is only so much work I can do in a day. Thanks for the article, I am a brand new reader, and I love it, I think you are right on these three skills. I agree that Strategy, analytics, and technology are the three pillars of digital or online marketing. I struggle with burnout because I write a lot of the same types of content about the same subjects. My clients respond positively when I get a little playful or poetic, but it seems like more and more that creative spark is missing. How do you find and nurture the poet’s voice in practical, more-than-a-motivational-Insta-post ways? I feel your pain — and live it. I write a lot about copiers (four versions of how to fix black lines on a copy and counting). I find that when I take the time daily or at least once a week to write on a personal blog that I don’t much care if anyone reads or not that helps to keep me interested when I get ground down by repetitive topics. Also, I’ve been writing about document management off and on for over 20 years. It’s the same thing as it ever was — hey, I can find my documents faster than walking to a filing cabinet — but it’s also constantly changing as new applications of the tech emerge. Look for the new in the same old, same old and you’ll often find something you didn’t expect or look at with a different point of view as you learn more. Brilliant! And, as a longtime copywriter, I am painfully aware of the lack of poetry (née emotion, hence persuasion) in today’s online content. What I’ve observed – and even suffered professionally by – is that too many clients and bosses don’t (perhaps can’t) recognize it. The focus currently seems to be on technical skill – craft and typos be damned! I’m looking forward to the day when content development as a discipline matures beyond this stage and decision makers recognize that typing is not writing. Thank you for helping me feel a little less alone. I’m here because in 2018 I want to evolve from baby freelance writer to grown-up business owner. The three killer skills you mention are going to be central to achieving this goal so I’m looking forward to learning more about them. I am new to Copyblogger and also am attempting my first romance novel. It Is definitely a learning process. I am excited for my future and will continue to read Copyblogger. You’ve grabbed my attention. I love the concept of being a killer/poet hybrid. I’m a researcher by background, and I’m good at strategy, but tech, not so much. I know that’s an area I will be working on this year. I need to face it and dive in! I’ve never thought of it exactly this way, but the killer/poet split makes a ton of sense to me. I know that there are times when I’ve tried to be more poet than killer and had my teeth kicked in by the results — even though I knew what I was doing hadn’t worked in the past, I’d occasionally try it (humorous subject lines — ok, semi-humorous). Sometimes, you have to take that inner poet by the throat and choke him out. Recently, tried a series of carefully crafted and designed CTAs. Didn’t work. Switched back to the ugly ones that the poet hates, but the killer loves because: results. As a published poet was astonished at reading your killer /poet juxtaposition. Am researching ways to integrate this poetic gift with more practical procedures for writing income growth.Your post is a serious challenge to making this wish a reality and wake-up to what is necessary to master the killer tech equation.Knowing that i don’t need to forfeit the poetic but do need to build a hybridized style that in the end is actually an enriched beginning. At the start of the year I’ve found one best article that will add value to my skill and increase my confidence. Thanks for sharing. I’ve only begun reading Copyblogger in the last year or six months as I continue my education in all things digital marketing. I majored in English in college, but it took me a good 12 years to figure out what I wanted to do with it. Now that I finally feel settled professionally, I’m excited to make up for lost time and learn everything I can about how to make my writing better. I’m looking forward to your posts in 2018! My focus this year is to be more data-driven/inspired in my writing. I tend to write about what comes to me easily and even though I am getting great feedback, my posts are not going the distance. I want to dive more into analytics and focus on trends – which after all is perhaps a good way of knowing what the readers really want. I also do graphic design as well as copywriting so I quite like offering design and content creation services in one. So my goal this year is to develop a more coherent offering of the two services!